Tokyo’s new National Museum of Territory and Sovereignty opened this year, a permanent collection of historical documents highlighting Japan’s official territorial claim over the Diaoyu/Senkaku and the Dokdo/Takeshima islands. Why would the Japanese government establish a museum for two sets of small islands? Little or not, these islands make for heated politics. Japan is in a dispute with China over the Diaoyu/Senkaku chain — and with South Korea over the Dokdo/Takeshima group of islands. 1) These small islands have prompted geopolitical frictions. A memorable moment at the PyeongChang Winter Olympics came when North and South Korean athletes marched in together, waving the unified Korean flag. Japan quickly denounced the flag as unacceptable. 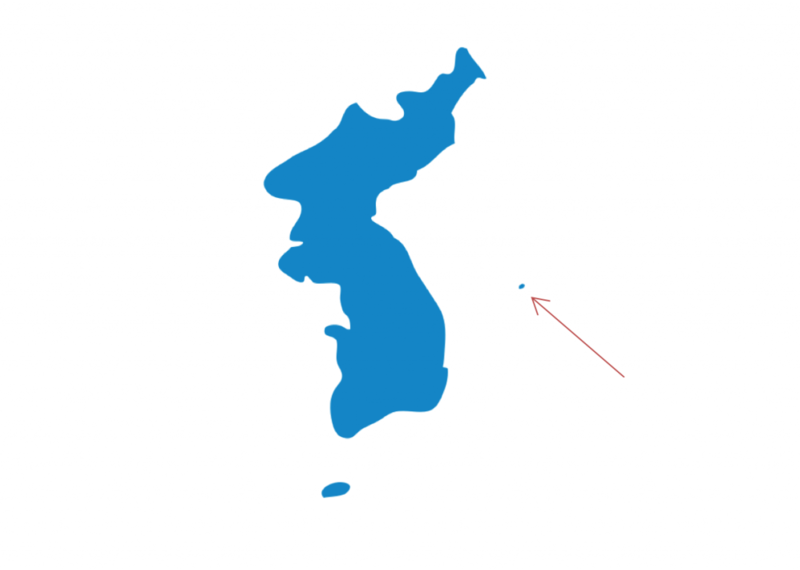 The big fuss was over a tiny speck next to a blue unified Korean Peninsula — the flag design included the contested Dokdo/Takeshima islands. (see arrow in Figure 1). Leaving small islands off maps can present big problems, just as easily. Marking the 40thanniversary of their Peace and Friendship Treaty, China and Japan aimed to enter into a period of détente in 2018, after years of often-strained bilateral relations. Yet there were hostile exchanges between Beijing and Tokyo in late January, this time involving Muji, a Japanese multinational selling household and consumer goods. 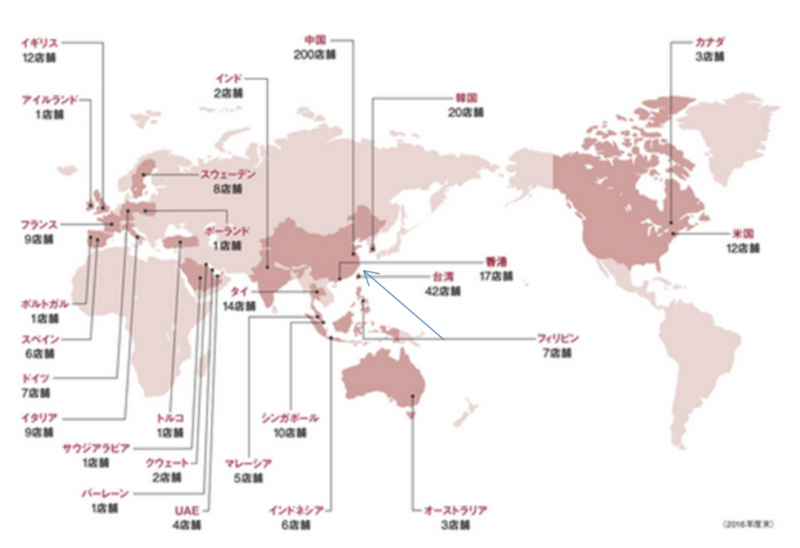 The company’s fall/winter catalogue featured a global map of Muji’s stores and omitted the Diaoyu/Senkaku Islands (see the blue arrow in Figure 2), a group of small uninhabited rocky islets in the East China Sea claimed by both Beijing and Tokyo. China was angry over the omission, among other things, and Japan was upset about the Chinese order to scrap the catalogues. 2) China/South Korea and Japan have long been at loggerheads over these islands. The Diaoyu/Senkaku Islands consist of five islets and three rocks located in the East China Sea, with a total area the size of 1,700 acres. The group of islands is about an equal distance (170 kilometres) from Taiwan and the closest Japanese island Ishigaki, in Okinawa Prefecture. The Diaoyu/Senkaku Islands are currently under Japanese administration though their sovereignty is contested by both China and Taiwan — when the Japanese government purchased the islands from a private individual in September 2012, there were protests in China and counter-protests in Japan. 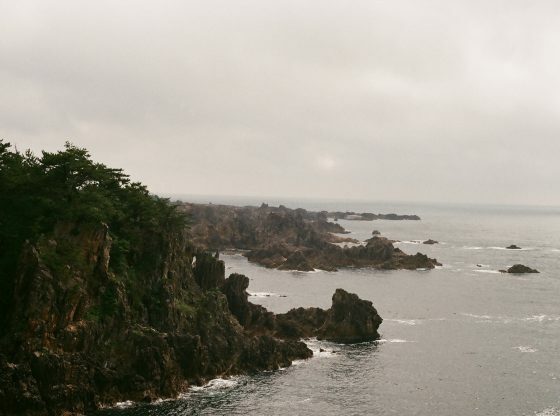 The Liancourt Rocks, known as Dokdo in Korean and Takeshima in Japanese, are a group of two small main islets and 35 smaller rocks, with a total surface area of 46.3 acres located about halfway (217 kilometres from Korea and 211 kilometres from Japan’s Honshu). While South Korea controls the territory, its sovereignty is contested by Japan. Interestingly, the unified Korean map does not show an indisputably Korean island, Ulleung-do, bigger than Dokdo/Takeshima and closer to Korea. China and Japan make different kinds of sovereignty claims. In the wake of the 2012 incident, I organized a group of international historians, legal scholars, and social scientists with expertise on these disputed islands. Our goal was to explore the difficult issues of causes, sovereignty, and solutions to the conflict. In The China and Japan Border Dispute: Islands of Contention in Multidisciplinary Perspective, one of our findings is that China’s claim rests primarily on historical evidence. Historian Gavan McCormack, for instance, argued that the main basis for Japan’s territorial claim, terra nullius— nobody’s land — may be less applicable today because it harkens back to a time when imperial powers divided up the world at will. On the other hand, according to legal scholar Ryan Scoville, Japan’s claim based on continuous possession in the last century fits international law more easily. The legal framework of acquisitive prescription states that one party can obtain title over part of the territory of another by continuous effective control in a peaceful and public manner for a sufficient period of time. My own research suggests that governments may use different strategies to form an official collective memory about a disputed territory. China’s claims include references to verifiable evidence such as voyages, discoveries, records and books, and maps ranging from the early 15thcentury to 1877. Japan’s claims reference verifiable evidence such as surveys, territorial markers, records of population and livelihood, treaties, and news reports — but these date from 1885 to the recent years, relying on a different range of reference. Countries may find a reason to keep up the disputes. We also found that sovereignty claims may serve a broader purpose — but in a far broader context. The Japanese government may actually benefit from the ongoing dispute, which gives it the ability to maintain leverage against China and boosts its reputation for resolve among other states in the region, as political scientist Krista Wiegand explores. And conflicts over small territories may help maintain a certain geopolitical order. The Diaoyu/Senkaku and the Dokdo/Takeshima disputes have deep historical roots that go back to the 1951 San Francisco Peace Treaty and the 1971 Okinawa Reversion Agreement. Closely examining the Allies’ documents, especially those of the U.S., East Asian historian Kimie Hara found a connection between the San Francisco Treaty and the Cold War frontiers in East Asia. She established that the San Francisco system created unresolved problems in the form of regional conflicts including the Dokdo/Takeshima, the Diaoyu/Senkaku, the Northern Territories, and the South China Sea islands. Her research suggests that the 1951 treaty and the 1971 agreement left the issue of sovereignty of the disputed islands in limbo, perhaps intentionally. These disputed islands are situated in a zone along the Acheson Line, a U.S. defensive perimeter running from the Aleutian Islands through the Ryukyu Islands to the Philippines, named after U.S. secretary of state under President Harry Truman. Small islands can indeed have big long-term geopolitical consequences. With a new Cold War perhaps on the horizon, these ongoing disputes may still serve the U.S.’s interests in balancing the geopolitical power in the Pacific, just like the Acheson Line did in the Cold War. Tim Liao is professor of sociology, statistics, and East Asian languages & cultures and Director of the Centre for East Asian & Pacific Studies at the University of Illinois, and a 2017-2018 Fellow at the Centre for Advanced Studies in the Behavioural Sciences (Stanford University). Image Credit: CC by mstaniaszek/Flickr. This article was first published on 17/04/2018 as ‘Why China, Japan and Korea fuss over tiny islands — 4 things to know‘ in ‘The Monkey Cage’ at the Washington Post.